Olalekan, left, and Arinola Olawusi have been charged with child neglect after their baby was found injured in their home. A Rhode Island couple is facing child neglect charges after their 3-month-old baby was found with critical injuries in their home. 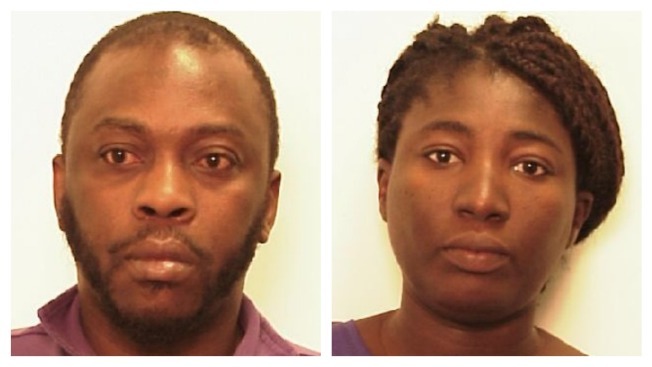 According to WJAR-TV, 40-year-old Olalekan Olawisi and 33-year-old Arinola Olawisi are both expected to be arraigned Tuesday on child neglect charges. Their baby was found injured Monday afternoon in their Providence home. Providence police said the baby was found by firefighters with broken bones, and is in "very critical condition." The father, Olalekan Olawisi, reportedly called 911. The cause of the injuries has not yet been determined.